After I preprocessed all my subjects. I’m trying to align my dwi data to the t1. I did that following the steps from the tutorial but it’s not giving me any good results. I’m hoping I did something very simple wrong and I’ve been trying to figure out the problem, but so far no success. 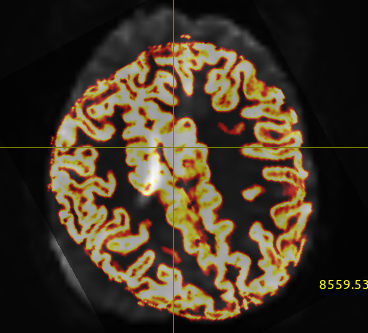 I extracted the mean_b0 from the preprocessed dwi image and I’m trying to align the 5ttgen (which I got from the T1 image). flirt works better with skull-stripped images, so if you have good masks for your B0 and T1w image, this could improve the registration. Why are you using in the flirt call -interp nearestneighbour? this suggest that the moving image is a label mask or something similar, you want to register the T1w with the B0. Finally, you could also add the flag -cost normmi to the flirt command, since you are doing an inter modality registration. I would also check to be sure than the 5tt and T1w image you are using to drive the registration are aligned. I hope this helps. My 5tt and T1 are perfectly aligned, I checked that . 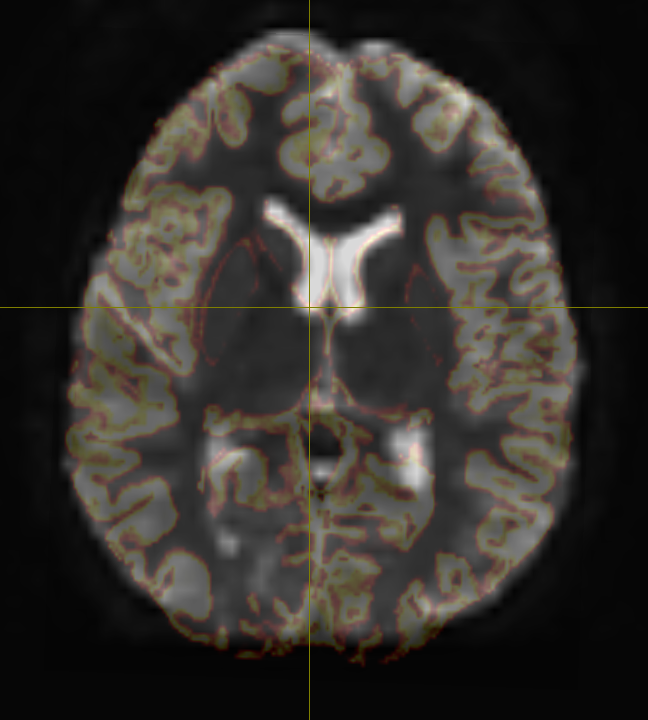 I already had a skull stripped B0 image but the T1 not yet, this indeed improved the alignment a lot! On some places it is slightly off, but I don’t know what the consequences are of that? And maybe good to mention that my subjects are +/- 10 year olds, maybe that has something to do with it as well? Good to know, that the results are better now. I think the processing should be the same for a 10 years child that for a baby, probably they have more movement but I believe all the processing steps to apply are the same. Basically is the same as before, but adding one extra step in the middle. This usually results in improved co-registrations. Thanks for this helpful information. May I ask another question about registration? 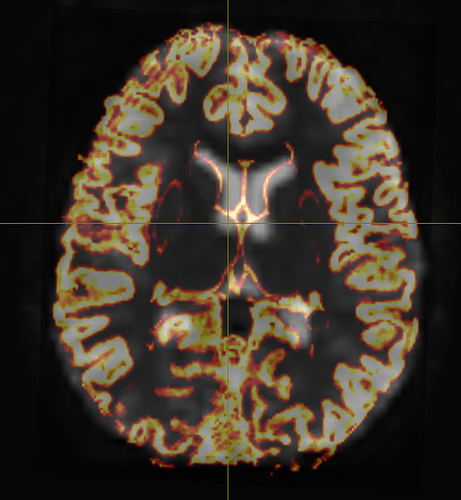 Should I use the b=0 image to register to the T1-weighted anatomical image, or the average of diffusion-weighted images to register to T1 image? What are the pros and cons for each case, assuming that DTI has been pre-processed and 6 degrees of freedom is used for registration. By the average diffusion weighted do you mean all the b values different from 0? In case of multi-shell data do you refer to only one b-value or to all of them? I would advise against averaging different b values, as they have different contrasts. I usually use the average of all the b0 to increase the SNR, but I don’t think it would be a big difference using only the first b0. The approach of using the average b0 is extended in the literature, but depending of the characteristics of your data, maybe you want to consider using a bvalue different from 0 (see here for an example). I have found the epi_reg script provided by FSL to perform very well in this situation (https://fsl.fmrib.ox.ac.uk/fsl/fslwiki/FLIRT/UserGuide#epi_reg). epi_reg takes advantage of a different registration technqiue called boundary-based recognition which seems to perform much better in this situation (https://fsl.fmrib.ox.ac.uk/fsl/fslwiki/FLIRT_BBR). It is a script (not a binary), so feel free to open it up to see exactly what it’s doing.